Carpus is a word derived from the Greek word karpos, which means "wrist." The wrist is surrounded by a band of fibrous tissue that normally functions as a support for the joint. The tight space between this fibrous band and the wrist bone is called the carpal tunnel. The median nerve passes through the carpal tunnel to receive sensations from the thumb, index, and middle fingers of the hand. Any condition that causes swelling or a change in position of the tissue within the carpal tunnel can squeeze and irritate the median nerve. Irritation of the median nerve in this manner causes tingling and numbness of the thumb, index, and the middle fingers – a condition known as "carpal tunnel syndrome." For most patients, any condition that exerts pressure on the median nerve at the wrist can cause carpal tunnel syndrome. Common conditions that can lead to carpal tunnel syndrome include obesity, pregnancy, hypothyroidism, arthritis, diabetes, and trauma. Tendon inflammation resulting from repetitive work, such as uninterrupted typing, can also cause carpal tunnel symptoms. Carpal tunnel syndrome from repetitive maneuvers has been referred to as one of the repetitive stress injuries. Some rare diseases can cause deposition of abnormal substances in and around the carpal tunnel, leading to nerve irritation. These diseases include amyloidosis, sarcoidosis, multiple myeloma, and leukemia. People with carpal tunnel syndrome initially feel numbness and tingling of the hand in the distribution of the median nerve (the thumb, index, middle, and part of the fourth fingers). These sensations are often more pronounced at night and can awaken people from sleep. The reason symptoms are worse at night may be related to the flexed-wrist sleeping position and/or fluid accumulating around the wrist and hand while lying flat. Carpal tunnel syndrome may be a temporary condition that completely resolves or it can persist and progress. The diagnosis of carpal tunnel syndrome is suspected based on the symptoms and the distribution of the hand numbness. Examination of the neck, shoulder, elbow, pulses, and reflexes can be performed to exclude other conditions that can mimic carpal tunnel syndrome. The wrist can be examined for swelling, warmth, tenderness, deformity, and discoloration. Sometimes tapping the front of the wrist can reproduce tingling of the hand and is referred to as Tinel's sign of carpal tunnel syndrome. Symptoms can also at times be reproduced by the examiner by bending the wrist forward (referred to as Phalen's maneuver). The diagnosis is strongly suggested when a nerve conduction velocity test is abnormal. This test involves measuring the rate of speed of electrical impulses as they travel down a nerve. In carpal tunnel syndrome, the impulse slows as it crosses through the carpal tunnel. A test of muscles of the extremity, electromyogram (EMG), is sometimes performed to exclude or detect other conditions that might mimic carpal tunnel syndrome. Can Carpal Tunnel Syndrome Be Treated or Prevented? Initial treatment usually includes rest, immobilization of the wrist in a splint, and occasionally ice application. Those whose occupations are aggravating the symptoms should modify their activities. For example, computer keyboards and chair height may need to be adjusted to optimize comfort. These measures, as well as periodic resting and range of motion stretching exercise of the wrists can actually prevent the symptoms of carpal tunnel syndrome that are caused by repetitive overuse. Underlying conditions or diseases are treated individually. Fractures can require orthopedic management. Obese individuals will be advised regarding weight reduction. Rheumatoid disease is treated with measures directed against the underlying arthritis. Wrist swelling that can be associated with pregnancy resolves in time after delivery of the baby. Many patients with carpal tunnel syndrome improve with conservative measures and medications. 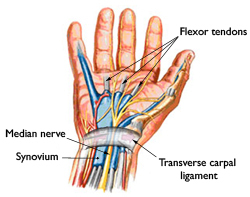 Sometimes, chronic pressure on the median nerve can result in persistent numbness and weakness. In order to avoid serious and permanent nerve and muscle consequences of carpal tunnel syndrome, surgical treatment is considered. 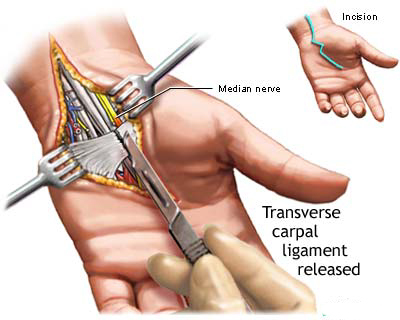 Surgery involves severing the band of tissue around the wrist to reduce pressure on the median nerve. This surgical procedure is called "carpal tunnel release." It can now be performed with a small diameter viewing tube, called an arthroscope, or by open wrist procedure. After carpal tunnel release, patients often undergo exercise rehabilitation. Though it is uncommon, symptoms can recur. Railroad workers work in some of the harshest conditions of any industry. The equipment and tools are often heavy, and operating the machinery and tools places a burden on muscles, joints and ligaments. Repetitive stress injuries such as carpal tunnel syndrome, "tennis elbow" and torn rotator cuffs are common. If you are a federal railroad worker in New York or other Northeastern state in the U.S. and are seeking compensation under the provisions of the Federal Employers' Liability Act (FELA), you will benefit by getting help from an experienced railroad injury lawyer. I am attorney Ira M. Maurer of Fishkill, New York. I have been helping injured railroad workers recover the injury benefits they deserve for more than 30 years. Proving injuries such as carpal tunnel syndrome and other repetitive stress injuries can be challenging. It is necessary to work closely with ergonomic specialists and orthopedic surgeons to establish a connection between the repetitive stress and the work place. I understand the medical and legal issues and know how to prove your claim. I have an excellent record of successful representation and have handled complex cases on a national level. When you’re injured on the job it can negatively affect your life beyond the pain it causes. With over 30 years of experience, I can help you understand how to win a repetitive stress/cumulative trauma injury case. The right lawyer can make a difference. Let The Maurer Law Firm, PLLC, make a difference in your life when you need it the most. If you or a loved one has developed carpal tunnel syndrome and want to know if you can make an injury claim to pursue compensation, please contact The Maurer Law Firm to schedule a free consultation with experienced, aggressive greater Hudson Valley and Fishkill injury lawyer Ira Maurer. Call 845-896-5295 today.